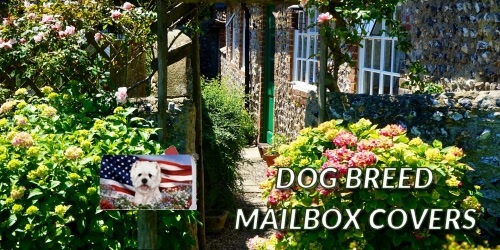 Dog Breed Mail Box Covers featuring beautiful dog breed artwork. Made of High Quality All Weather Vinyl. Fits a Standard size 6 x 19 inch metal or non-metal mail box. Cover attaches with 2 magnetic strips along bottom edge and also includes 4 stick em magnets for non-metal mail boxes. Reusable. Made in USA. Mailbox is not included.